Studio, Other Shape Guitar from PRS. 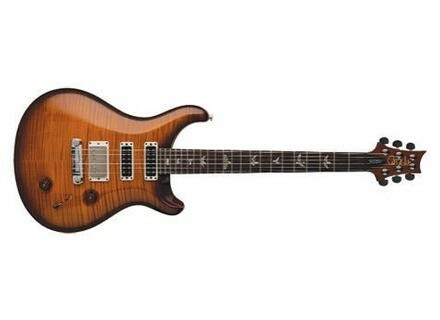 Channel super nice, I had a PRS already made in Korea therefore being the same tune, it is the same feeling. Correct weight, not specially heavy. For sound, this is simply excellent. The NF is a structure humbucker pickups but geometrically more concentrated. The effect is a humbucker type sound but much less fat, they have a more pronounced attack, even in the grave or even a humbucker style of Sh-2 SD bouzeux sound a bit, here it sounds clear and defined. The sound is nonetheless more than a single coil load but with an unusual definition. It's a bit the best of all worlds. In short, they always sound more defined and fuller than a humbucker a single coil that will always sound a bit thin. Turning down the volume is gradually entering the field of single coil (they installed a HPF in the volume knob). The Humbucker is the bridge for its part vintage, its volume is similar to that of NF. The sound is good as a good vintage humbucker has the Gibson, and more can be defined because of the guitar. The sustain is obviously important (it is a PRS). It's a gem, nothing has been drooling watching ca. The guitar sounds extremely well and is great fun to play. The ideas come individually the coup. This is a super versatile and inspiring instrument. I was torn between it and the 513. But trying both, there was no comparison. The 513 too tries to do everything and not really well defined character. The studio also allows many things but with a right spirit quenching. It's safe, it's expensive, but still, unless a Les Paul for example, and compare, ca is not debatable in terms of quality and sound (I hope not to offend the person, but c This is my opinion).